We’re happy to announce that Minwoo Park has joined Realm and will be helping us from Seoul, Korea! Read on for more details and join our Realm Korea Facebook Group or send an email to our Korean address. 박민우님이 Realm 에 합류 했습니다! 한국 개발자들의 Realm 사용을 지원하게 됩니다. 현재 운영되고 있는 Realm 한국 사용자 그룹 을 포함해 한국어 이메일 등의 채널을 통해 기술지원을 하고 모임 등도 꾸준히 운영할 예정입니다. 기술적인 질문을 포함한 다양한 의견 등 어떤 내용이든지 환영합니다. 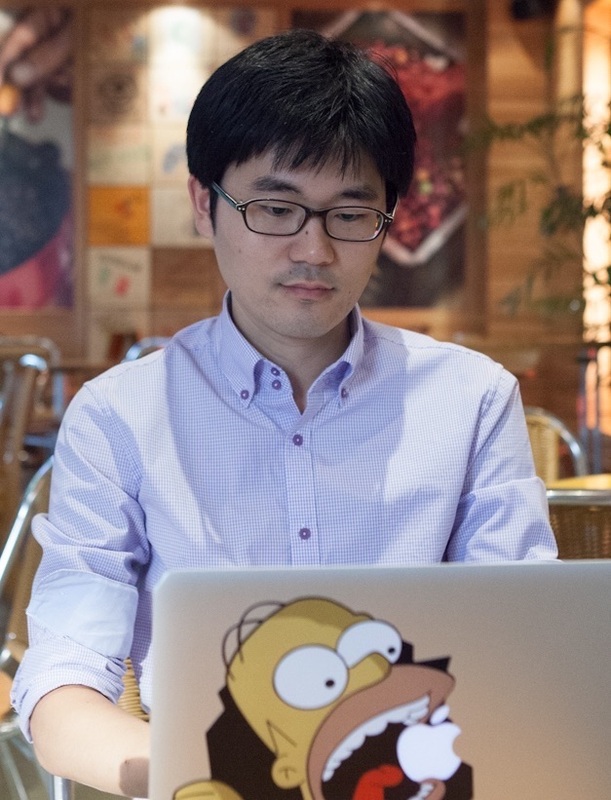 Minwoo Park is a software engineer who has been programming for many mobile and web projects. He is passionate about helping the developer community, and has worked as a developer evangelist for the last four years. Minwoo has spoken at many Korean developer conferences, including DEVIEW, H3, GDG, NDC, and OSCON. He has also organized many developer conferences, hackathons, and meetups. He will help us by growing & supporting the Realm community in South Korea! Follow Minwoo on Twitter or drop him an old fashioned email. 박민우님은 다양한 웹 개발과 모바일 개발을 해온 개발자 입니다. 최근 4년간은 개발자 에반젤리스트로 일했으며 개발자 커뮤니티를 지원하는 것은 그가 열정을 가지고 있는 분야이기도 합니다. DEVIEW, H3, GDG 그리고 NDC와 같은 다양한 국내 개발자 컨퍼런스를 포함해, 미국 포틀랜드에서 열리는 오픈소스 컨퍼런스인 OSCON 에서도 다양한 개발주제를 가지고 발표하였습니다. 개발자 컨퍼런스 등 다양한 개발자 행사를 운영했던 경험을 살려 Realm의 한국 개발자 커뮤니티가 자라날 수 있도록 돕는 역할을 하게 되었습니다. 박민우 님을 트위터에서 팔로우 하시거나 email 로 연락 주십시오. 감사합니다. The Realm community has expanded quite a bit in Korea since we launched in July 2014! Tim Anglade, VP of Product at Realm, spoke at Seoul’s DEVIEW conference in September 2014 and released Realm for Android while on stage. This demonstrated the importance of Korean developers in the Realm community. 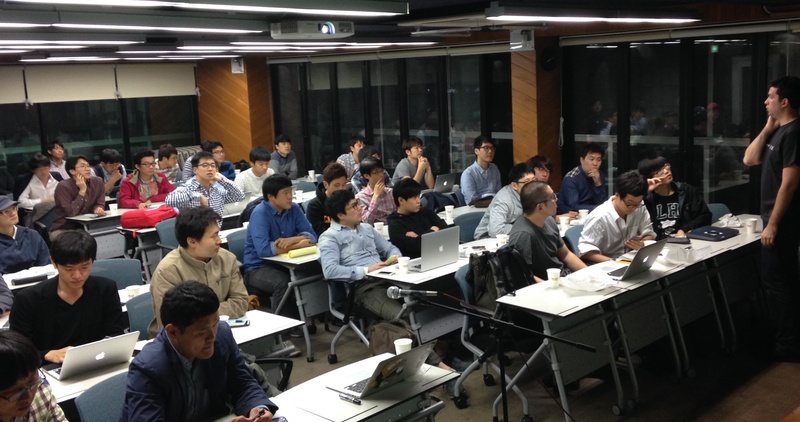 We had our first meetup with more than 80+ developers at Seoul in 2014, and a few more successful meetups in 2015 (#1, #2). Currently, many Korean apps are already using Realm, including Retrica, Cymera, RidiBooks, CJmall, and Interpark. In Korea, we plan to hold regular meetups to exchange technical information, help Realm users meet each other, have a coding club, hackathon, hold office hours, and so on. Realm 사용자 커뮤니티는 2014년 7월에 Realm SDK 가 공개된 이후 꾸준히 발전해 왔습니다. Realm의 제품 담당 임원인 Tim Anglade 가 서울에서 열린 DEVIEW 컨퍼런스에서 Realm: Android와 iOS를 위한 데이터베이스 세션을 진행 하였고, Realm Android SDK는 그 세션에서 공개 되었습니다. 이는 Realm 이 한국 Android 사용자를 얼마나 중요하게 생각하고 있는지를 보여줍니다. 현재 레트리카, 싸이메라, 리디북스, CJmall, 인터파크 투어 를 포함한 다양한 한국 앱들이 이미 Realm을 사용하고 있습니다. 그 다음주에는 첫 Realm 개발자 모임을 강남 토즈타워에서 가졌고 80분 이상의 개발자 가 참석해 주셨습니다. 또한 2015년에도 현재까지 2번의 개발자 모임을 (#1, #2) 가졌습니다. 앞으로도 한국에서 정기적인 개발자모임을 가지고 기술적인 정보를 교환하는 등 Realm 사용자 분들이 서로 만날 수 있는 기회를 만들 계획입니다. 또한 코딩 클럽, 해커톤, 오픈 오피스 등의 행사도 기획하고 있습니다. 페북에서 운영중인 Realm 한국 사용자 그룹 에 기술이슈나 사용 경험, 프리젠테이션 자료, 사용 팁 등을 공유해 주십시오. 물론 한국어로 소통하시면 되며, @realm 트위터로 연락주셔도 됩니다. If you’d like to work with Minwoo & the rest of us, take a look at our jobs page.